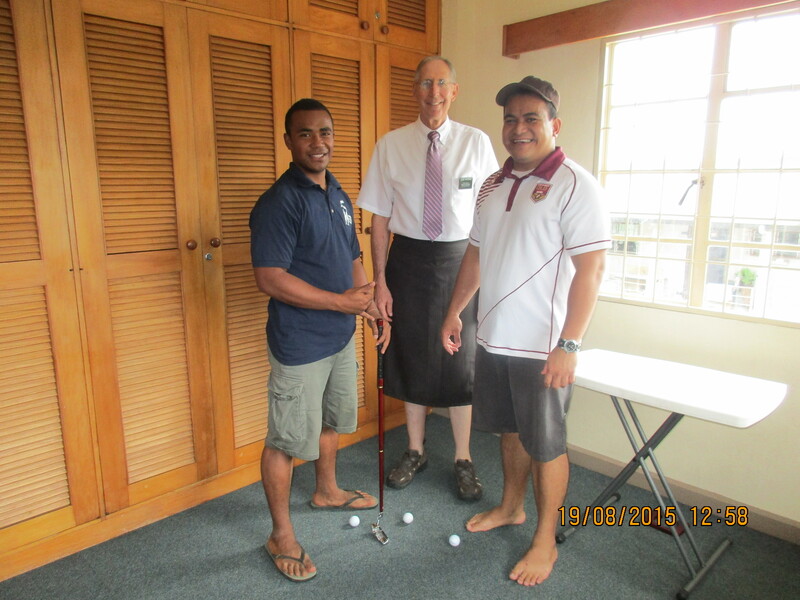 August 17-23 – Craig and L'Or L.
Tomasi reading with us and sharing his testimony of the Book of Mormon. Monday morning Tomasi discovered that his Self-Reliance class at the Service Center was not going to be held, so he came and joined us in scripture study at the institute. He is a special guy. 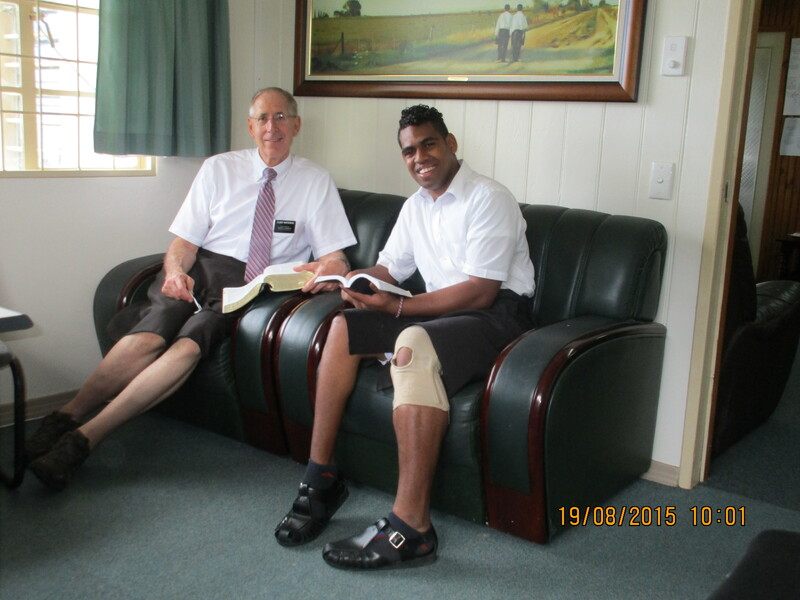 He told me that he went on his mission to show the Lord how much he loved Him — then pointed to all the pictures of missionaries on our board, and said they were going all over the world doing the same thing. He told us that he knew the Book of Mormon was true as soon as he read the introduction to it. We have a lot to learn from him. That was just about our last quiet moment all week! We didn’t hold classes because of semester break, so the Institute of Religion pretty much turned into an institute of recreation! The YSAs who came in during the week had heaps of fun, and I baked or prepared tons of veggies/goodies/sandwiches. They had so much fun playing putt putt, we’ve decided we need to hold a tournament and give the “Masters” winner a green sulu. Out of school for a week, and all smiles! Tui and David, contenders for the green sulu. 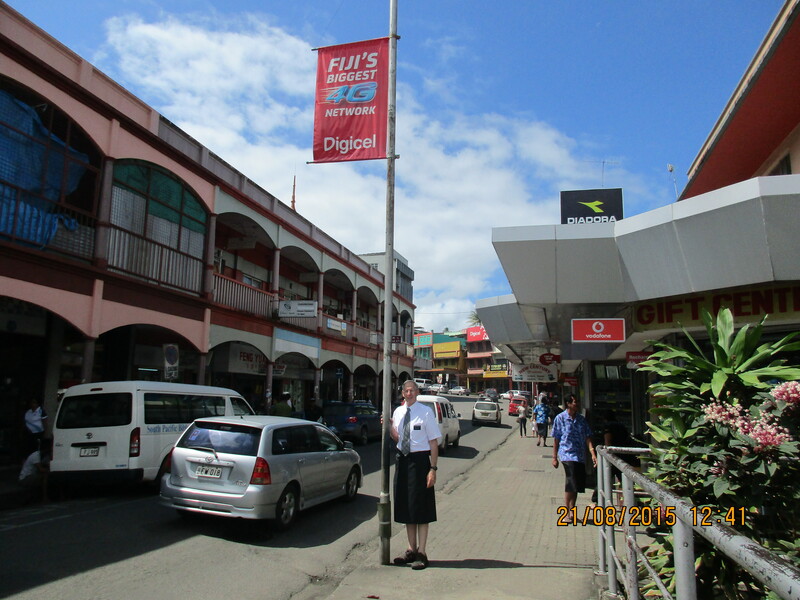 Turns out even Suva has a “China Town.” When we went shopping on our preparation day, so many people told us we could find the items we needed in the Chinese shops, we decided it would be worth the walk to find them. We thought we were already there when I took this picture, but when we went up a little further and turned onto Cummings, it was being in San Francisco’s Chinatown! Unlike the Chinese shops concentrated in one block, you can find cell phone stores on every corner. Saying goodbye is so hard to do! Saturday we sang “God Be With” you to Seniloli. Oh, how we will miss him. He leaves Wednesday for a mission to Australia. 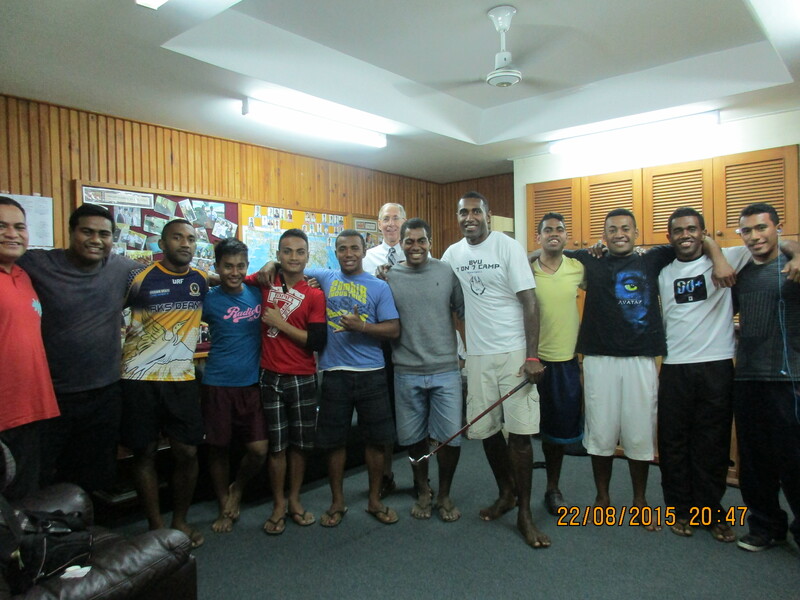 The all male choir ready to sing to Seniloli (“Dodi”). 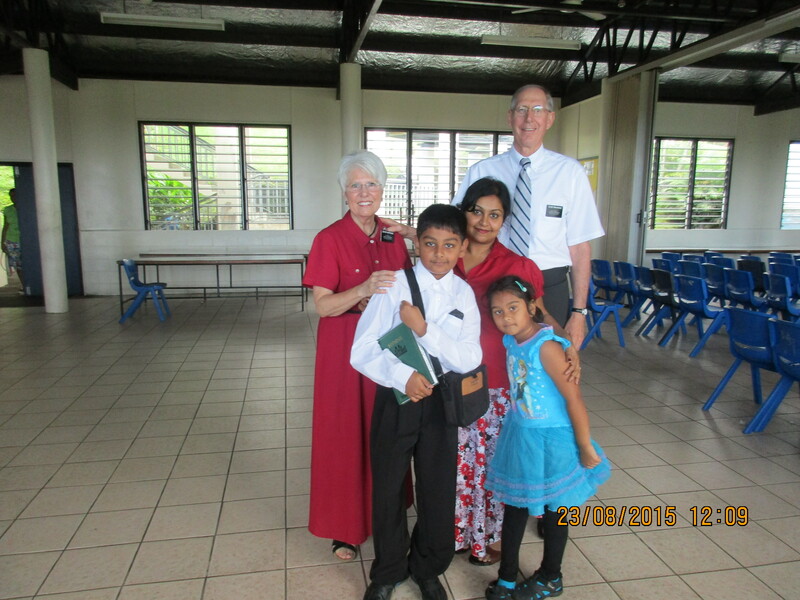 A wonderful highlight this week was witnessing the baptism of Priya and her son Ivan. Priya was Hindu, but said she felt confused and lost until she was taught by the missionaries. — A group of boys having a blast playing rugby in a muddy field, so covered with mud head to foot that they were one solid color. — A little boy running for his life from a mud covered pig (moving surprisingly fast) right after him, while the adult nearby seemed totally unconcerned! –Me, finding a gecko under under our couch or a mongoose out our front door and just telling them to get out of the way, or typing this while I smash ants and not skipping a beat. 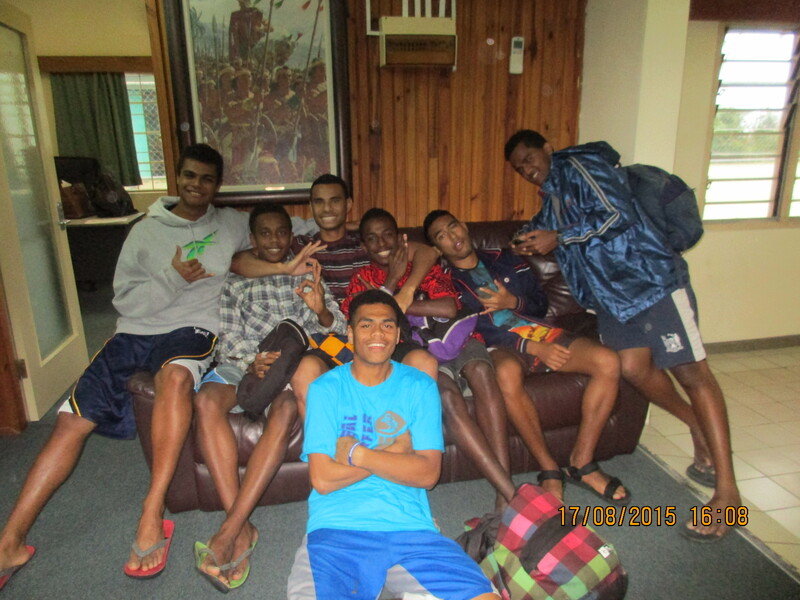 That proves it — we are almost Fiji-ized:) And Indian-ized. This week we tried mathai and Priya’s bhajiya — yum! We’re still loving it here. It’s been another beautiful week in Fiji!